Please submit your comments and I will publish them on this page. Jason,I want to give you a heads up, my last few sessions at berkeley have been great, planning pretty good now, both directions. I want to thank you soo much. Anyway, will be in Cabarete next week to practice some more. What's next? I'll call when I get back for more lessons! I've attended Jason's Maui camp (October 2006) and his Rio Vista camp (June 2007). I signed up for Maui because the venue looked good (house on the beach & equipment ready!) and Jason had tossed me a great heli-tack tip that summer. I didn't go to Maui expecting to learn anything--I knew ahead of time that, between the coral, the tide, and the waves of the Pacific, I wouldn't want to do anything more than go back and forth and jibe. It turns out that I didn't know what I needed to learn! Jason changed my stance and now I sail with more confidence. Jason's Rio Vista camp at Rio Viento is a great venue--just like Maui, everything is right there and the video analysis was excellent. There, too, I learned something I didn't know I needed to learn and I planed through a duck jibe for the very first time. Yahoo! These were my first experiences having someone follow me around and call out to me what to do. It really works. So does Jason's magic advice: Relax! Smile! Hey Jason, it's Bob. I am calling you about 2 things: Number 1, for turning me on to the Finworks fin. I got out today in really heavy conditions overpowered. That fin is fenomenal! Its faster and it points better. If you start your bottom turn overpowered you don't have to worry about spinning out. Number 2, I talked to Mini-Jason today (he is inside my head). I said "what am I doing wrong? I am having a problem". He said "you sheet out when you are entering a jibe" so I stopped doing that. Now I can handle the overpowered conditions. Anyway it was a great day and I hope you are doing well. Call me when you are back in town. See ya! Calling to say thanks a lot for making our summer Great! 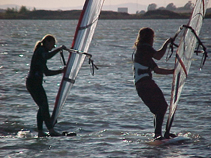 I learned so much from you about windsurfing this season. I'm really enjoying the sport now and it's largely because of your great instruction. Hope you had a good time in Orlando, we wish you a great time in Maui, well got to go. ...I know who you are. We need to get together sometime because I really need your help. I heard you are the best in the Bay Area. THANKS a lot! After four lessons with you we learnt so much that we are now hooked on this sport completly. It's time to buy our own toys.